The King contemplated the field with apprehension, the opposing armies had long since become entangled and confused. Empowered by the Queen at his side, he searches for a way to apply strategy to this chance encounter on an unfamiliar battlefield. Will you send your opponent’s uncovered King to the bar, thus risking all your Pawns already home? Which piece will you leave uncovered when the dice go bad? Every roll can change the game, every choice can affect your position in the march toward victory. Welcome to the world of Chessgammon, where Chess-like strategy meets Backgammon-like chance! 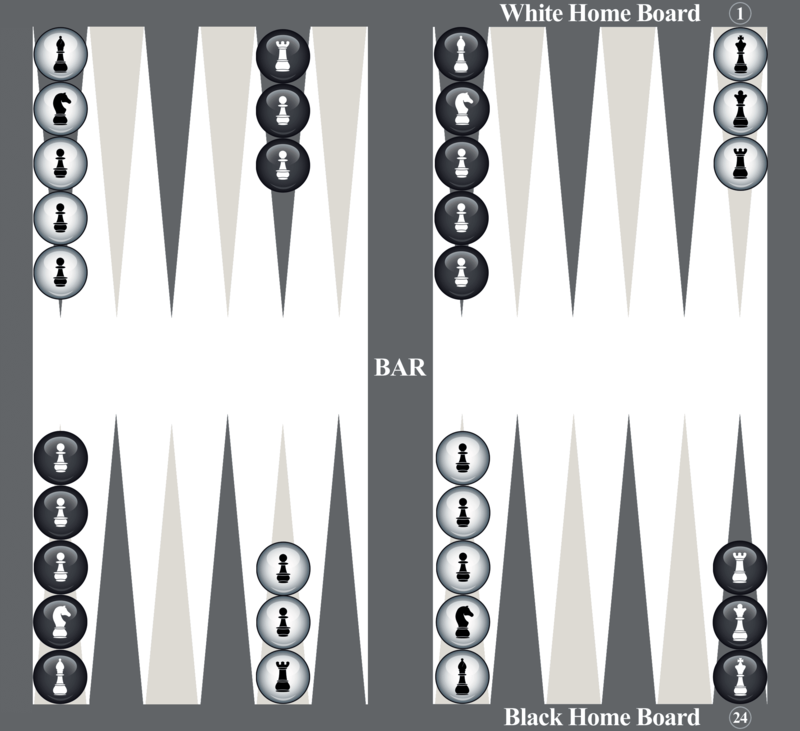 Standard rules of Backgammon apply, some of which are described herein; instances where Chessgammon rules alter standard Backgammon rules are also noted. One must first learn the rules of Backgammon before playing Chessgammon. Whether by roll of dice, coin toss, rock-paper-scissors, or Magic 8-Ball... randomly determine which player moves first. The winner of the game is the first player to bear off their King and Pawns from the board. In order to bear off, a player must first move all their pieces into their home board. Except the King, pieces move the number of points equal to the result of one die or any combination of dice. A legal move is one which ends on an unoccupied or friendly occupied point. Pieces which have the ability to move forward or backward, may use multiple dice to move both forward and backward on a given turn. • Pawns move forward only. • Knights move forward or backward. Once per turn each Knight may add one to any one die; when this ability is used, the resulting number of the die is changed to determine the landing point of the Knight. • Bishops move forward or backward. Once per turn each Bishop may subtract one from any one die, except on a die result of one; when this ability is used, the resulting number of the die is changed to determine the landing point of the Bishop. • Rooks move forward or backward. • The Queen moves forward or backward. Once per turn the Queen may use one die twice, landing first before duplicating her move. • The King moves forward only and only once per turn, except on a roll of doubles. On doubles, the King may use two dice making two moves on that turn. Regardless of the resulting die number, the King moves only one point per die. • Rooks protect up to two Pawns from the King’s special Pawn hitting ability (explained below); if a player has both Rooks on the same point, their abilities combine to protect up to four Pawns. The Rook cannot be hit by a single Pawn -- it takes two Pawns to hit the Rook. • The Queen cannot be hit by any single piece, except the Queen or King -- other than an opponent’s Queen or King, it takes two pieces to hit the Queen. • The King is the most powerful and complex piece in Chessgammon — take extra time to comprehend his special abilities. The King starts farthest from the goal and generally only moves once per turn, but a wise King can dominate the board on his steady march to victory. - The King cannot be hit by any single piece -- it takes two pieces to hit the King. A King cannot be used to hit an opponent’s King. - The King may move onto an opponent’s “block” (2 or more pieces on a point) causing all pieces in the block to be pushed backward to the next unoccupied or friendly occupied point. Simultaneously, all Pawns not protected by a King or Rook are hit. Pushed pieces are hit if there is no legal point to which they can retreat. - The King may move onto a point occupied by his opponent’s King. In doing so, any pieces with opponent’s King are protected, neither pushed nor hit, and remain in that point with both Kings. While both Kings occupy this same point, no other pieces may enter that point; any pieces with the opponent’s King must be moved out of the point before that King may move. The lone King may be moved as normal without restriction. When “entering” (returning to play from bar), pieces maintain their identity but lose all special abilities. Entering counts as a move. Once they have entered, their abilities return and may be used on the same turn if possible. When in the process of using two pieces to hit a piece having the special ability of a lone block (Rook, Queen & King), all movement is considered simultaneous. Thus, any piece entering along with another piece moving to hit the opponent’s Rook, Queen, or King is legal. When in the bearing off position, the King is still restricted to moving once per turn (except on a roll of doubles). The King can only bear off from point 1 or 24. Pieces having the ability to move backward may be moved out of their home board rather than bearing off; those pieces must move back into their home board before any pieces may bear off (further). Killer Queen: Is the Queen not powerful enough for you? In this variant the Queen additionally gains the special movement abilities of the Knight and Bishop, to be optionally used once per turn. Berserker King: Want more action? In this variant the King may now move as many dice as available during a turn, still only moving one point per die. Faulty Tower: Need more challenge protecting Pawns? In this variant remove from the game the Rooks starting on the King/Queen point during setup. Experiment and give us feedback!